Ultra Gentle Micellar Mousse Cleanser is produced by the Ukrainian beauty brand Bio Pharma Laboratory owned by the pharmaceutical scientific and research centre Alliance of Beauty. The cleanser is suitable for all skin types, including sensitive skin. It is a unique 5-in-1 product formulated with natural moisturising and soothing ingredients. Developed by pharmacists. Ultra Gentle Micellar Mousse Cleanser by Bio Pharma is based on micelles, active micro particles that bind dirt, excess sebum and make-up residue. They effectively cleanse the skin without drying it out. The effect of micelles is complemented and enhanced by natural ingredients, such as olive oil, chamomile extract, aloe vera leaf juice, and a vitamin-rich herbal infusion. The product is suitable even for overly sensitive skin. 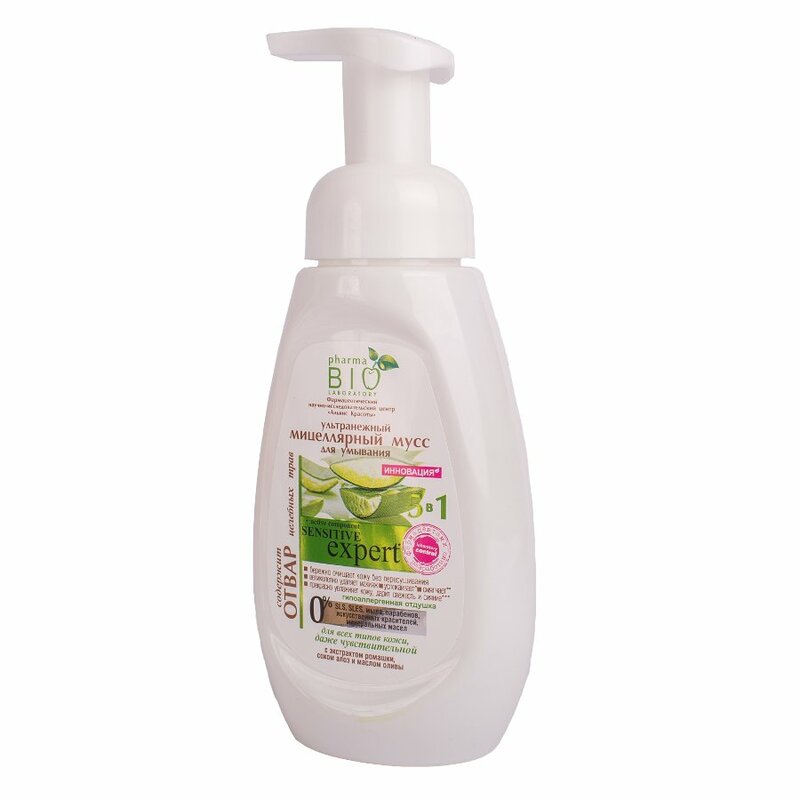 Bio Pharma's Micellar Mousse Cleanser is a 5-in-1 cleansing and conditioning product. It 1) delicately cleanses the skin without drying it out; 2) excellently copes even with waterproof make-up; 3) softens the skin due to chamomile extract and olive oil; 4) soothes the skin, relieves irritation and inflammation due to a special active ingredient named SymCalmyn; 5) contains aloe vera leaf juice that moisturises the skin and makes it look fresh and glowing. The product is free of SLS/SLES, soap, parabens, mineral oil, and synthetic colourants. Directions. Apply onto wet skin of your face and neck, massage, rinse. Ingredients. Aqua, Disodium Cocoamphodiacetate, Disodium Laureth Sulfosuccinate, Glycerin, PEG-40 Hydrogenated Castor Oil; Parfum, Aloe Barbadensis Extract, Chamomilla Recutita Flower Extract, Panthenol, Allantoin, Hydrogenated Olive Oil, Decoctum: Bidens Tripartita, Matricaria Chamomilla, Plantago Major, Calendula Officinalis L.; Butylene Glycol, Pentylene Glycol, Dihydroavenanthramide D; Benzyl Alcohol, 5-Chlor-2-Methyl-4-Isothiazolin-3-one; vitamins complex A, E, F: Retinyl Palmitate, Tocopherol Acetate, Linoleic Acid (and) Linolenic Acid, Arachidonic Acid (and) Lecithin; Citric Acid, EDTA. Want to buy Ultra Gentle Micellar Mousse Cleanser? Call us or submit your order via our web site!